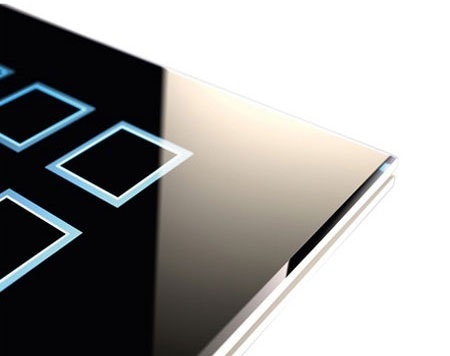 The system allows the complete control of lamps in your home. You can manage the simple ON-OFF command and the control of the intensity of each individual light point. 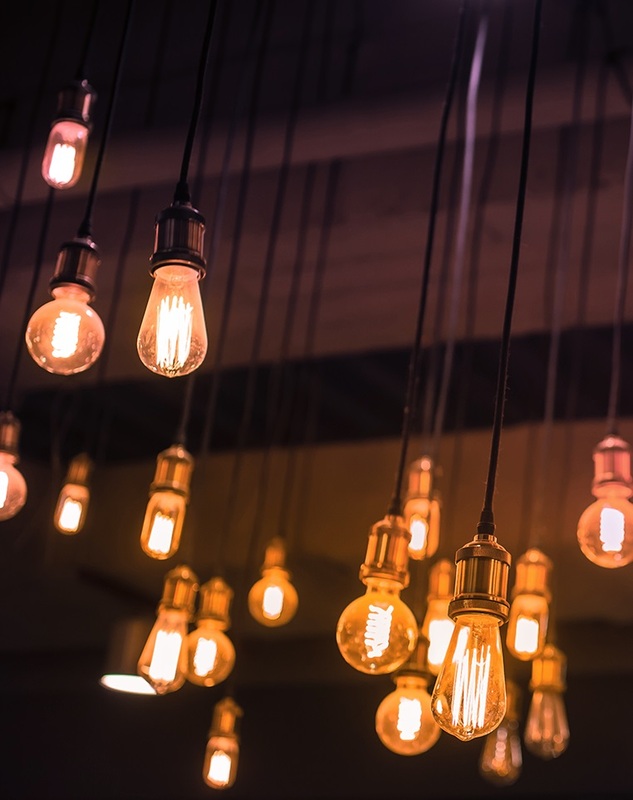 It allows the lights to be turned on in relation to time periods or daytime or nighttime light, or when someone passes, using the volumetric sensors of the anti-intrusion system to create and recall personalized scenarios directly by the client. 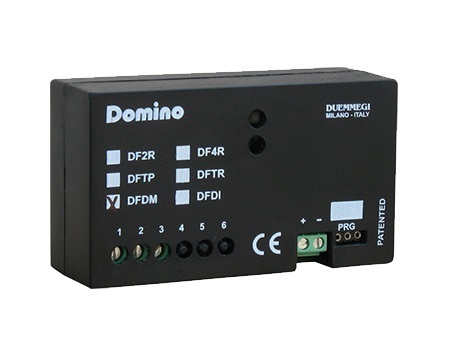 DF8RIT module for Domino bus performs, in a single box, the following features: 8 digital inputs for potential free contacts, 8 power-relay outputs which can be set for ON-OFF command or for the management of rolling shutters, 1 analog input for temperature probe, ambient temperature regulator function, featuring weekly programming. Housing: 6M modular DIN box of reduced height. 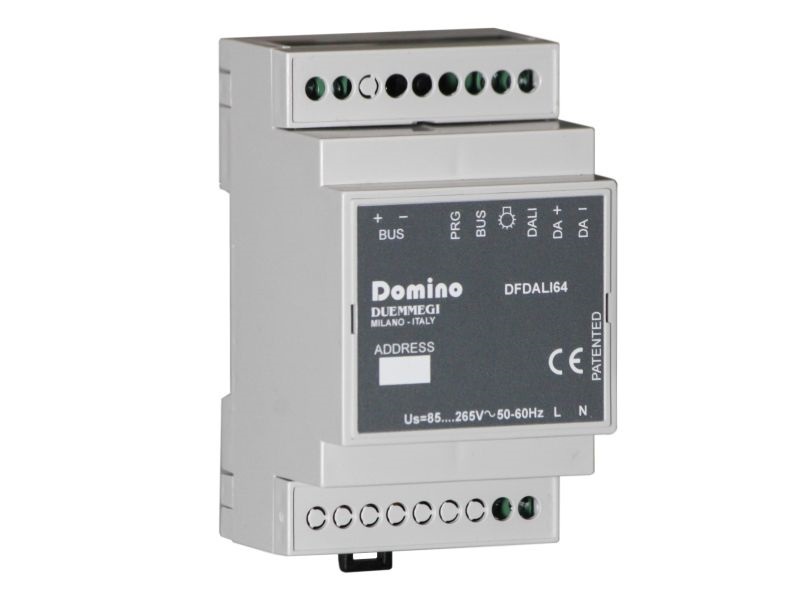 DF4I modules allow to transmit, through the bus Domino, 4 ON-OFF signals derived from pushbuttons, switches, and any other free-potential contact supplied by a voltage reference available from the module itself. 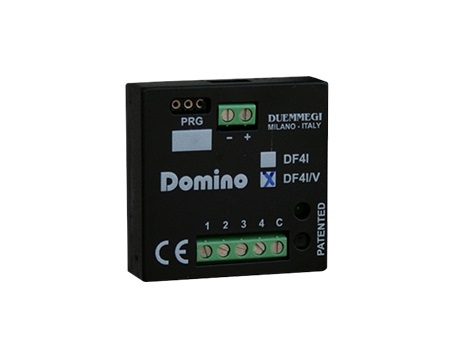 DF4I/V modules are identical to DF4I modules, but in addition they provide 12 virtual points to allow the combination of programming functions. 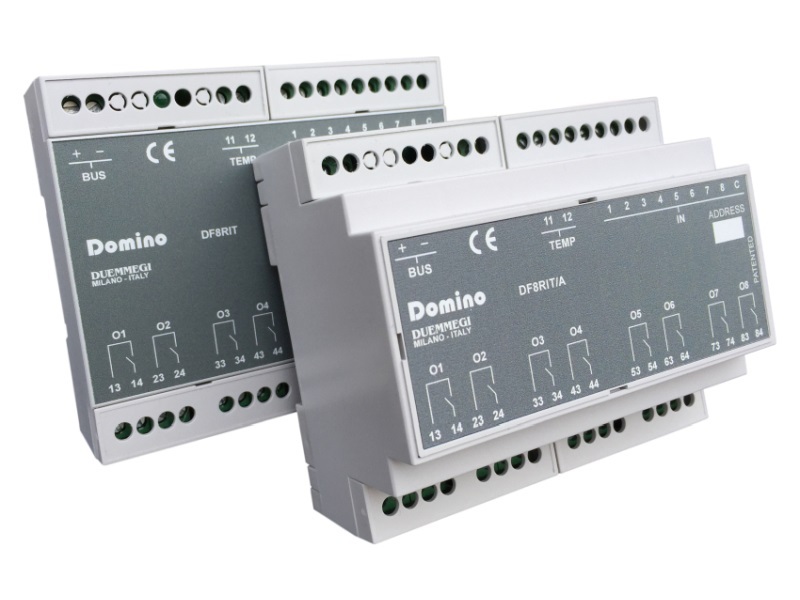 DF8I modules allow to transmit, through the bus Domino, 8 ON-OFF signals derived from pushbuttons, switches, and any other free-potential contact supplied by a voltage reference available from the module itself. 3 modules housing for DIN rail mounting. 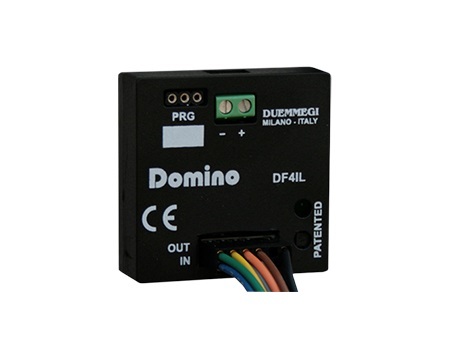 DF8IL module allows, through the Domino bus, the acquisition of 8 ON-OFF signals and the driving of 8 LEDs. 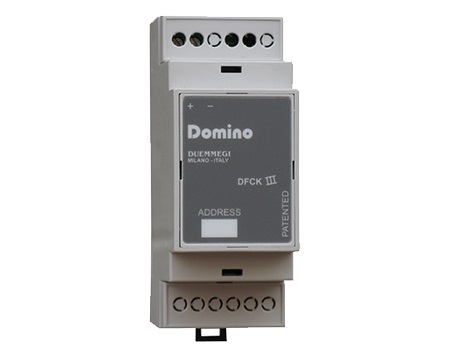 The small dimensions of DF8IL module allow the positioning directly in the standard wall box (503 or similar), on the back of the command switches or pushbutton; thanks to this feature, it is possible to use the switching devices of the preferred manufacturer. DFIR module allows to receive from an infrared remote control up to 124 independent channels and to send them on the bus Domino for command execution. In addition, DFIR module provides 2 inputs for ON-OFF signals to be connected to pushbuttons, switches, and any other free-potential contact. 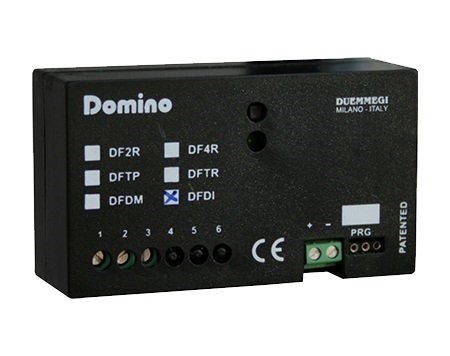 DF4RI module for Domino bus performs, in a single box, 4 digital inputs for potential free contacts, 4 virtual points and 4 power-relay outputs which can be set for ON-OFF command or for the management of rolling shutters. Housing: 3M modular DIN box of reduced height. 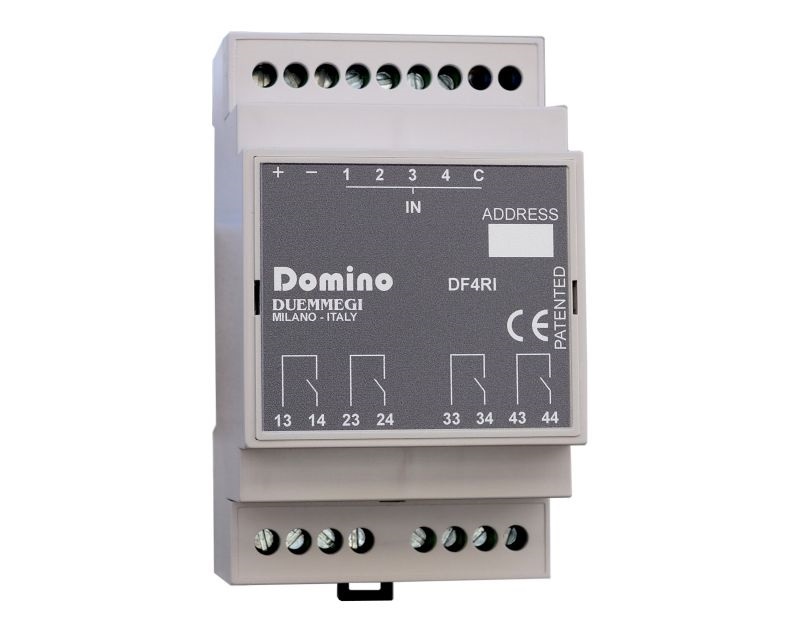 DF4RI module for Domino bus performs, in a single box, 4 digital inputs for potential free contacts, 4 virtual points and 4 power-relay outputs which can be set for ON-OFF command or for the management of rolling shutters. Housing: 3M modular DIN box. DFDIM power dimmer module allows the regulation, through the Domino bus, of incandescent and halogen lamps up to 500W, and dimmable LED and ESL/CFL lamps up to 100W. 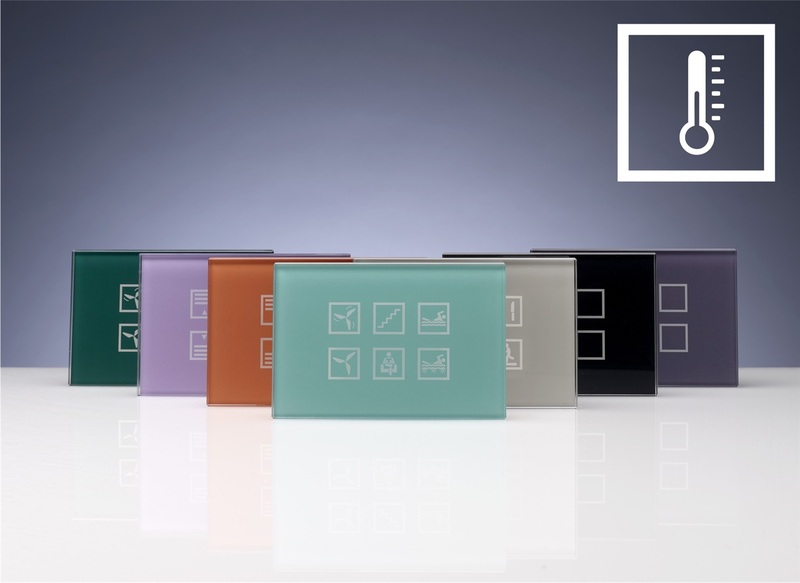 DFDIM module uses the MOS transistor technology, allowing a low heating dissipation and to protect the module against overloads, short circuits and over voltages. 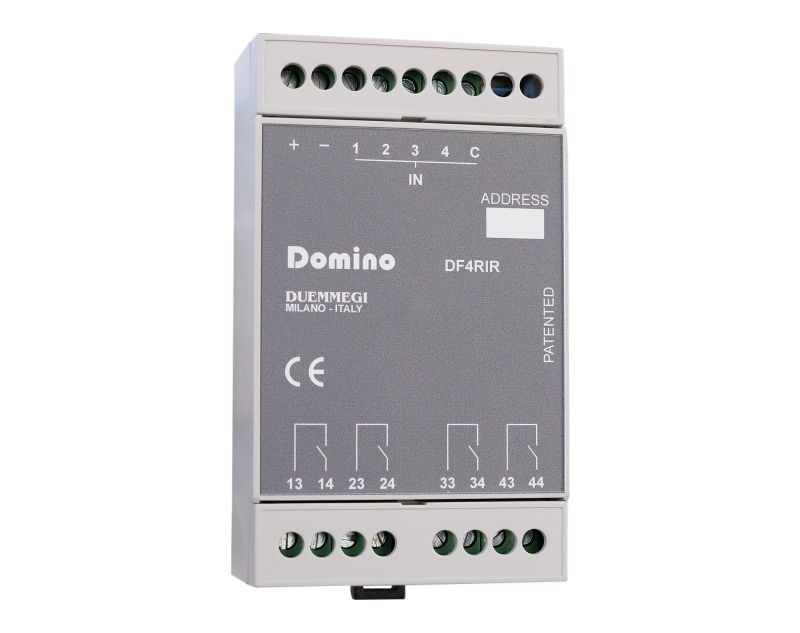 DF4DV output module allows to control, through the Domino bus, 4 devices with 0÷10V input, typically dimmers or electronic ballasts, but also modulating valves and similar actuators. 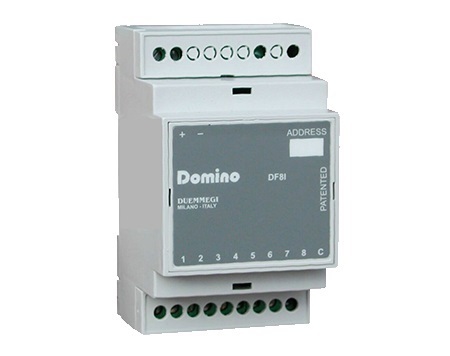 The module can be controlled by pushbuttons connected to Domino input modules or by a supervisor or by a video-terminal (e.g. touch screen). For DIN rail mounting. 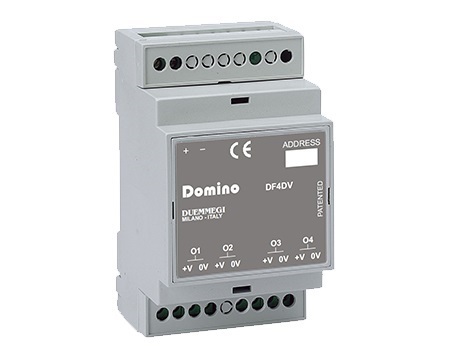 DFDV output module allows the driving, through the Domino bus, of one external dimmer or electronic ballast for the regulation of fluorescent lamps; the module provides an internal power relay to break the supply to the ballast in order to ensure the complete switch-off of the lamps. 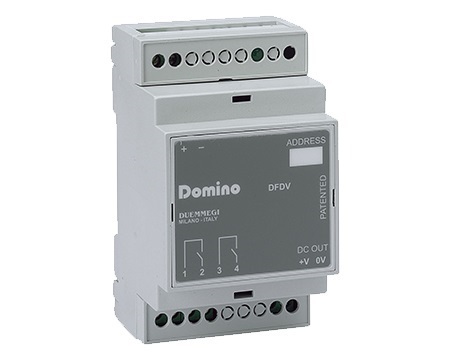 DFDV module also provides a power relay output for ON-OFF general purposes. DFCKIII module has been developed to be used in association with a terminal (touch screen or other device) used as graphical interface of the clock module, thus allowing to show and set the date and time and to edit the scheduled times. 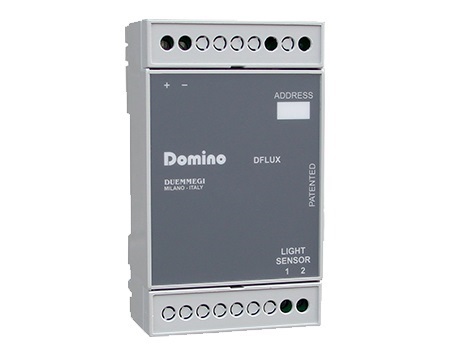 DFLS module allows to transmit, over the Domino bus, the ambient brightness value. 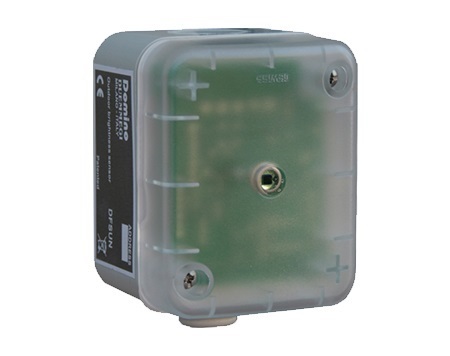 DFLS-P version provides a built-in presence sensor. DFLS also includes an algorithm for the automatic regulation of the ambient light in conjunction with the DFLDALI64 module, even without DFCP controller. 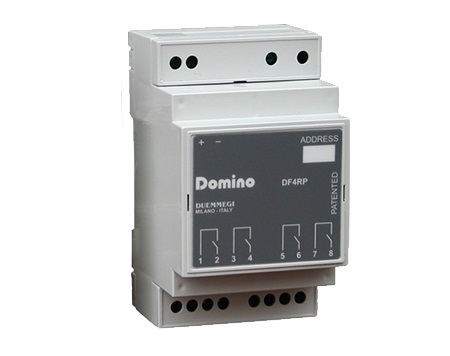 DFLS module provides two generic Domino digital inputs; one of these ones can be set as input for additional presence sensors (e.g. SRP) that will be paralleled to the presence sensor. DFLS module can be well applied in the brightness regulation of offices, stores and open spaces, allowing to develop applications complying with the new European norms about the energetic classification of the plants (European Norm EN 15232). 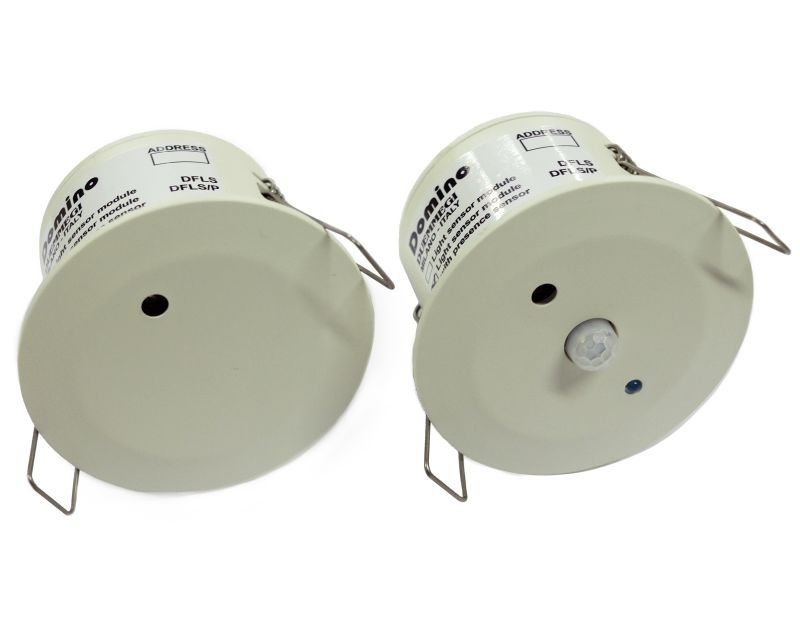 DFLS module is suitable for false ceiling mounting. 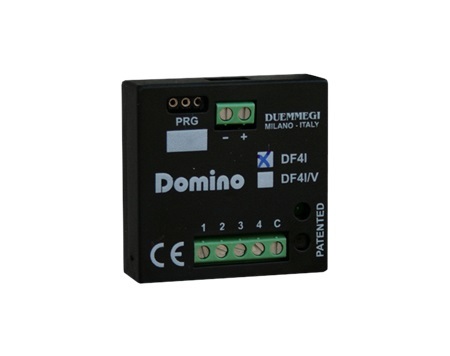 DFSUN module allows to transmit, over the Domino bus, the ambient brightness value detected by a sensor inside the module itself. DFSUN module can be well applied for the brightness regulation for external or internal applications in industrial plants. 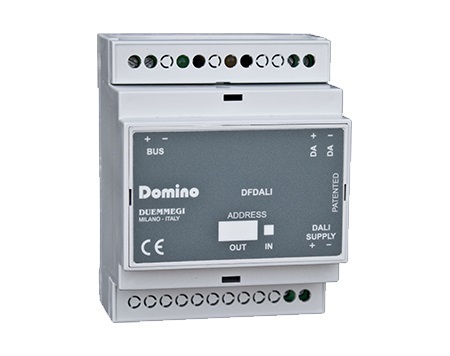 DFDALI64 module allows the interfacing between Domino bus and DALI bus for the management of the lighting. DFDALI module features 1 DALI line on which it’s possible to connect up to 64 devices that will be automatically addressed by the module. Version 2.0 of DFDALI64 module allows now the automatic brightness regulation when combined with Domino DFLS sensor, even without DFCP controller. DFDALI module allows the interfacing between Domino bus and DALI bus for the management of the lighting. DFDALI module features 1 DALI line on which it’s possible to connect up to 32 devices. 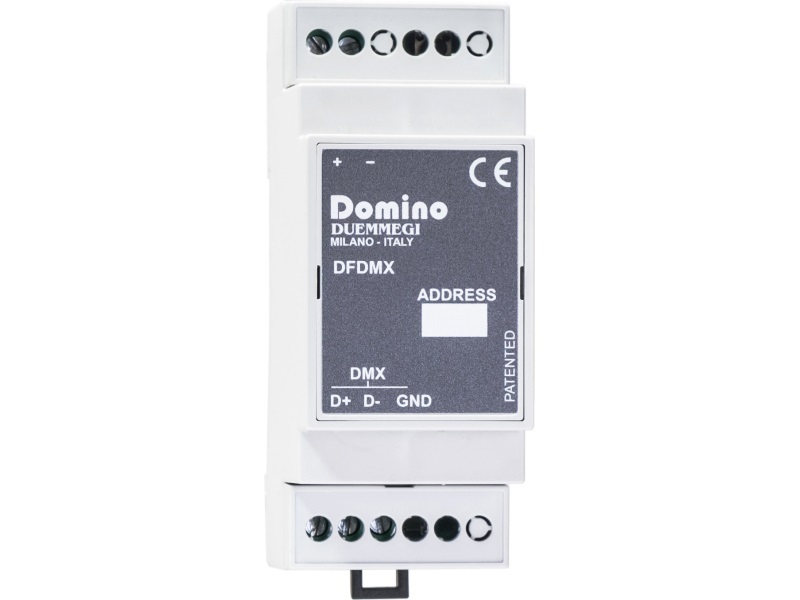 DFDMX module allows to handle, through the Domino bus, up to 32 DMX devices. DFDMX module makes possible the communication on the first 64 channels of the 512 allowed by DMX protocol and it can be successfully employed in professional lighting applications such as theaters, disco clubs, architectural lighting, etc. New version in 2M housing. DFIGLASS is a “touch” keypad available in the version with 6, 4, 3 and 2 commands, specifically developed for the Domino bus system. The front panel is made by glass; available colors: white, black and custom colours. Each keypad, regardless of the number of buttons, is back-lighted by LEDs. The keypad can be configured to generate a beep at any touch of the buttons. Suitable for mounting in wall box mod. 503. 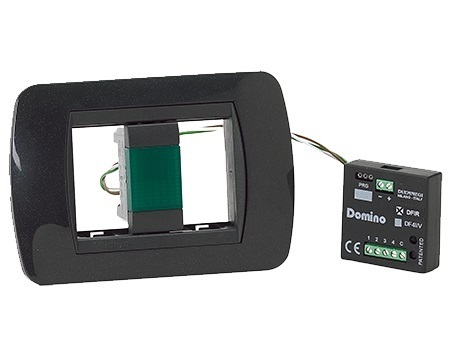 DFIGLASS/T is a “touch” keypad with INTEGRATED TEMPERATURE PROBE available in the version with 6, 4, 3 and 2 commands and specifically developed for the Domino bus system. The front panel is made by glass; available colors: white, black and custom colours. Each keypad, regardless of the number of buttons, is back-lighted by LEDs. The keypad can be configured to generate a beep at any touch of the buttons. Suitable for mounting in wall box mod. 503. DISCONTINUED. REPLACED BY DFDI2 V.8. 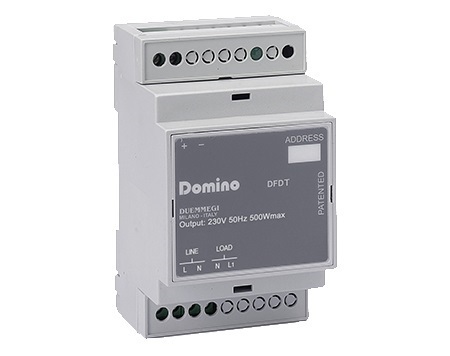 DFDI2 dimmer output module allows the brightness regulation, through the Domino bus, of loads up to 500W. Thanks to the IGBT technology, DFDI2 module can be configured for resistive, capacitive e inductive loads (incandescent lamps, halogen lamps supplied by electronic transformer and halogen lamps supplied by inductive transformer). 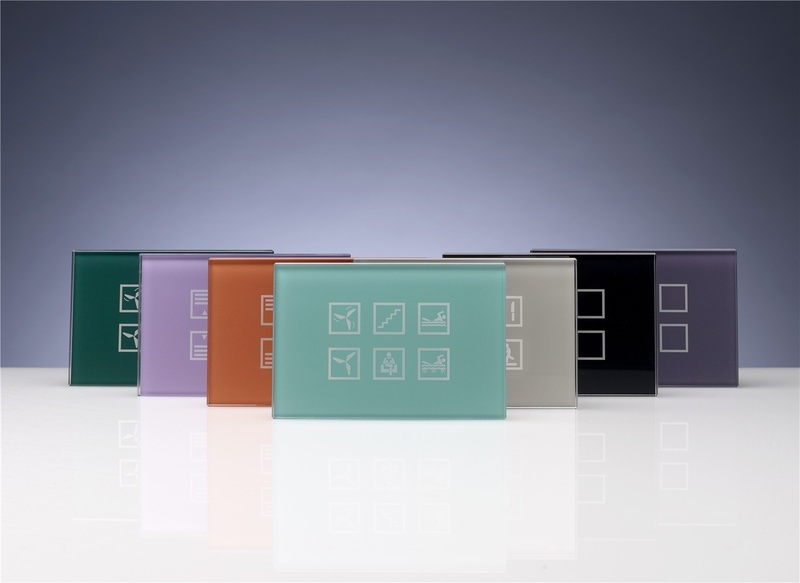 DFDI2 module also features protection against overcurrent, overvoltage, short circuit and overtemperature protection. Housing: DIN 4M for rail mounting. DF4IL module allows the acquisition of 4 ON-OFF signals and the driving of 4 voltage outputs for LEDs or small lamps (e.g. luminous pushbuttons). The small dimensions allow the positioning directly in the standard wall box. 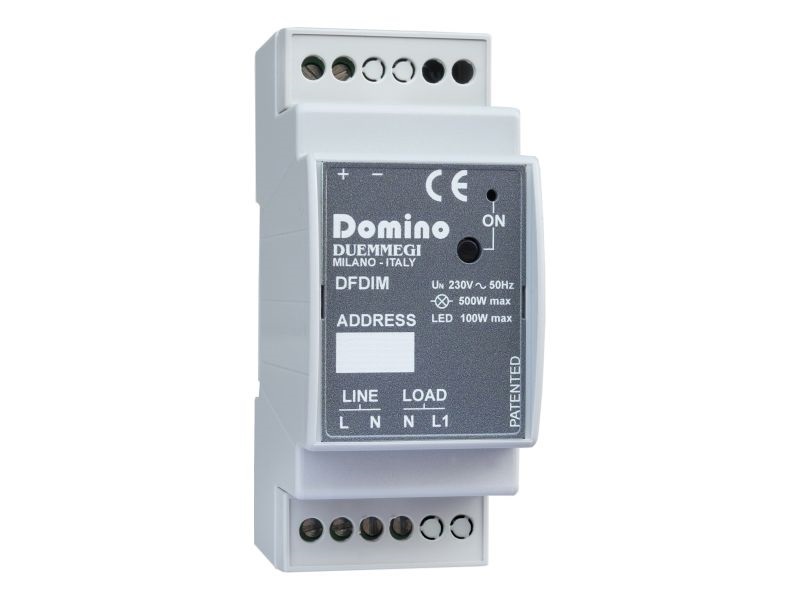 DFDM dimmer output modules allow the driving, through the bus Domino, of 1 resistive or inductive load, such as incandescent or halogen lamps and transformer for low voltage halogen lamps. DFDT dimmer output module allows the driving, through the bus Domino, of resistive or inductive loads up to 500W, such as incandescent or halogen lamps and transformer for low voltage lamps. Housing for DIN rail. 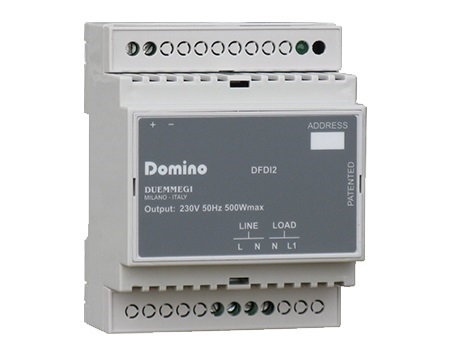 DFDI dimmer output module allows the regualtion, through the Domino bus, of many kinds of load. Thanks to the IGBT technology, DFDI module can be configured for resistive, capacitive e inductive loads (incandescent lamps, halogen lamps supplied by electronic transformer and halogen lamps supplied by inductive transformer). DFDI module also features overcurrent and overtemperature protection. It is suitalble to be installed into wall box. DF4RP modules allow the driving, through the bus Domino, of 4 loads, such as lamps, heaters, etc. Suitable for mounting on Din rail. 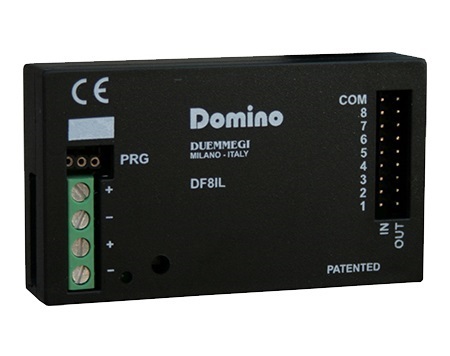 DFLUX module allows to transmit, over the Domino bus, the ambient brightness value detected by a provided sensor.